Gorizia [ɡoˈrittsja] listen (Slovene: Gorica, German: Görz, Friulian: Guriza) is a town and comune in northeastern Italy, in the autonomous region of Friuli Venezia Giulia. It is located at the foot of the Julian Alps, bordering Slovenia. It is the capital of the Province of Gorizia and a local center of tourism, industry, and commerce. Since 1947, a twin town of Nova Gorica has developed on the other side of the modern-day Italian–Slovenian border. The entire region was subject to territorial dispute between Italy and Yugoslavia after World War II: after the new boundaries were established in 1947 and the old town was left to Italy, Nova Gorica was built on the Yugoslav side. Taken together, the two towns constitute a conurbation, which also includes the Slovenian municipality of Šempeter-Vrtojba. Since May 2011, these three towns are joined in a common trans-border metropolitan zone, administered by a joint administration board. Gorizia is located at the confluence of the Isonzo and Vipava Valleys. It lies on a plain overlooked by the Gorizia Hills. Sheltered from the north by a mountain ridge, Gorizia is protected from the cold Bora wind that affects most of the neighbouring areas. The town thus enjoys a mild Mediterranean climate throughout the year, making it a popular resort. The name of the town comes from the Slovene word gorica meaning "little hill", which is a very common toponym in Slovene-inhabited areas. Originating as a watchtower or a prehistoric castle controlling the fords of the river Isonzo, Gorizia first emerged as a small village not far from the former Via Gemina, the Roman road linking Aquileia and Emona (the modern Ljubljana). The name of Gorizia was recorded for the first time in a document dated April 28, 1001, in which the Holy Roman Emperor Otto III donated the castle and the village of Goriza to the Patriarch of Aquileia John II and to Count Verihen Eppenstein of Friuli. The document referred to Gorizia as "the village known as Goriza in the language of the Slavs" ("Villa quae Sclavorum lingua vocatur Goriza"). Count Meinhard of the Bavarian Meinhardiner noble lineage, with possessions around Lienz in Tyrol, is mentioned as early as 1107; as a vogt of the Patriarchate of Aquileia he was enfeoffed with large estates in the former March of Friuli, including the town of Gorizia, and as early as 1127 called himself Graf von Görz. The borders of the county changed frequently in the following four centuries due to frequent wars with Aquileia and other counties, and also to the subdivision of the territory in two main nuclei: one around the upper Drava near Lienz, the other centered on Gorizia itself. Between the 12th century and early 16th century, the town served as the political and administrative centre of this essentially independent County of Gorizia, which at the height of its power comprised the territory of the present-day regions of Goriška, south-east Friuli, the Kras plateau, central Istria and East Tyrol. In 1500, the dynasty of the Counts of Gorizia died out and their County passed to Austrian Habsburg rule, after a short occupation by the Republic of Venice in the years 1508 and 1509. Under Habsburg dominion, the town spread out at the foot of the castle. Many settlers from northern Italy moved there and started their commerce. Gorizia developed into a multi-ethnic town, in which Friulian, Venetian, German and Slovene language was spoken. In mid-16th century, Gorizia emerged as a centre of Protestant Reformation, which was spreading from the neighbouring north-eastern regions of Carniola and Carinthia. The prominent Slovene Protestant preacher Primož Trubar also visited and preached in the town. By the end of the century, however, Catholic Counter-Reformation had gained force in Gorizia, led by the local dean Janez Tavčar, who later became bishop of Ljubljana. Tavčar was also instrumental in bringing the Jesuit order to the town, which played a role in the education and cultural life in Gorizia thereafter. Gorizia was at first part of the County of Görz and since 1754, the capital of the Princely County of Gorizia and Gradisca. 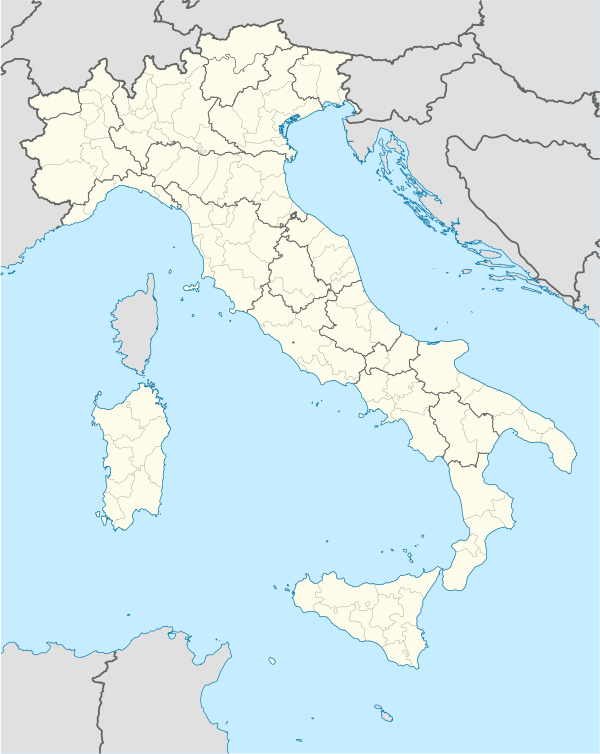 Regarding ecclesiastical matters, after the suppression of the Patriarchate of Aquileia in 1751, the Archdiocese of Gorizia was established as its legal successor on the territory of the Habsburg Monarchy. Gorizia thus emerged as aRoman Catholic religious centre: the archdiocese of Gorizia extended over a large territory extending to the Drava river to the north and the Kolpa to the east, with the dioceses of Trieste, Trento, Como and Pedena subject to the authority of the archbishops of Gorizia. A new town quarter developed around the Cathedral where many treasures from the Basilica of Aquileia were transferred. Many new villas were built conveying to the town the typical late Baroque appearance, which characterized it up to World War I. 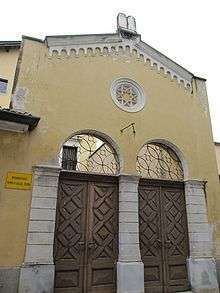 A synagogue was built within the town walls, too, which was another example of Gorizia's relatively tolerant multi-ethnic nature. During the Napoleonic Wars, Gorizia was incorporated to the French Illyrian Provinces between 1809 and 1813. After the restoration of the Austrian rule, the Gorizia and its County were incorporated in the administrative unit known as the Kingdom of Illyria. During this period, Gorizia emerged as a popular summer residence of the Austrian nobility, and became known as the "Austrian Nice". Members of the former French ruling Bourbon family, deposed by the July Revolution of 1830, also settled in the town, including the last Bourbon monarch Charles X who spent his last years in Gorizia. Unlike in most neighbouring areas, the revolutionary spring of nations of 1848 passed almost unnoticed in Gorizia, thus reaffirming its reputation of a calm and loyal provincial town. In 1849, the County of Gorizia was included in the Austrian Littoral, along with Trieste and Istria. In 1861, the territory was reorganized as the Princely County of Gorizia and Gradisca and granted a high degree of regional autonomy. At the time, Gorizia was a multiethnic town: Italian and Venetian, Slovene, Friulian and German were spoken in the town centre, while in the suburbs Slovene and Friulian prevailed. Although some tensions between the Italian-Friulian and the Slovene population were registered, the town continued to maintain a relatively tolerant climate, in which both Slovene and Italian-Friulian culture flourished, until World War I. 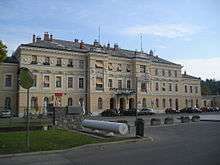 At the eve of World War I, Gorizia had around 31,000 inhabitants and was thus the 3rd largest town in the Austrian Littoral, after Trieste and Pula (Pola). Another 14,000 people lived in the suburbs, making it among the most populous urban agglomerations in the Alpe-Adria area, ahead of Klagenfurt, Maribor, Salzburg, Bolzano or Trento. Within the city limits, around 48% of the population was Italian or Friulian speaking, against a 35% of Slovene speakers. In the suburbs, the Slovene speakers prevailed, with a 77% against a 21% of Italian/Friulian speakers. In the first years of Italian administration, Gorizia was included in the Governorate of the Julian March (1918–1919). In 1920, the town and the whole region became officially part of Italy. The autonomous County of Gorizia and Gradisca was dissolved in 1922, and in 1924 it was annexed to the Province of Udine (then called the Province of Friuli). In 1927 Gorizia became a provincial capital within the Julian March adiministrative region. During the fascist regime, all Slovene organizations were dissolved and the public use of Slovene language was prohibited. Underground Slovene organizations, with an anti-Fascist and often irredentist agenda, such as the militant insurrectionist organization TIGR, were established as a result. Many Slovenes fled to the Kingdom of Yugoslavia and to South America, especially to Argentina. Many of these emigrants became prominent in their new environments. Very few Slovene-speaking intellectuals and public figures decided to stay in the town, and those few who did, like the writer France Bevk, were subject to persecution. After the Italian armistice in September 1943, the town was shortly occupied by the Slovene partisan resistance, but soon fell under Nazi German administration. Between 1943 and 1945 it was incorporated into the Operational Zone Adriatic Littoral. The town was briefly occupied by the Yugoslav Army in May and June 1945. With the arrival of the Yugoslav partisans in Gorizia in May 1945 a fierce repression began against the opponents, or potential opponents of the regime. At least 1,048 Italian civilians and military disappeared. According to some historians, many of the killings and violence suffered by the Italian ethnic group in Gorizia (and the rest of Friuli and Venezia Giulia) by the Yugoslav army were perpetrated as part of an ethnic cleansing practiced by Tito. Soon the administration was transferred to the Allies who ruled the town for more than two years, amidst fierce ethnic and political turmoil. On September 15, 1947, the town was incorporated into Italy again. Several peripherical districts of the Gorizia municipality (Solkan, Pristava, Rožna Dolina, Kromberk, Šempeter pri Gorici, Vrtojba, Stara Gora, Ajševica, Volčja Draga, Bukovica, Vogrsko) were handed over to the Socialist Federal Republic of Yugoslavia, together with the vast majority of the former Province of Gorizia. Around a half of the pre-war area of the municipality of Gorizia, with an approximate 20% of the population, were annexed to Yugoslavia. The national border was drawn just off the town centre, putting Gorizia into a peripheral zone. Several landmarks of the town, such as the Kostanjevica Monastery, Kromberk Castle, the Sveta Gora pilgrimage site, the old Jewish cemetery, and the northern railway station, remained on the other side of the border. In 1948, the authorities of the Socialist Republic of Slovenia (with president Josip Broz Tito's special support) started building a new town called "Nova Gorica" ("New Gorizia") on their side of the border. Though a border city, Gorizia was not crossed by the border with Yugoslavia as often erroneously claimed. This image stems mainly from the presence in Yugoslav territory of old buildings once belonging to Gorizia: these include the old railway station of the line that connected the town of Gorizia to the Austro-Hungarian capital Vienna. Although the situation in Gorizia was often compared with that of Berlin during the Cold War, Italy and Yugoslavia had good relations regarding Gorizia. These included cultural and sporting events that favoured the spirit of harmonious coexistence that remained in place after Yugoslavia broke up in 1991. Nowadays, Gorizia hosts several important scientific and educational institutions. Both the University of Trieste and the University of Udine have part of their campuses and faculties located in Gorizia. Other internationally well-known institutes from Gorizia are the Institute of International Sociology Gorizia, the Institute for Central European Cultural Encounters, and the International University Institute for European Studies. The majority of the population of Gorizia is of Roman Catholic denomination. The town is the seat of the Archbishop of Gorizia, who was one of the three legal descendants of the Patriarchate of Aquileia (along with the Patriarchate of Venice and the Archdiocese of Udine). Between mid-18th century and 1920, Gorizia was thus the center of a Metropolitan bishopric that comprised the Dioceses of Ljubljana, Trieste, Poreč-Pula and Krk. Several important religious figures lived and worked in Gorizia during this period, including Cardinal Jakob Missia, Bishop Frančišek Borgia Sedej, theologians Anton Mahnič and Josip Srebrnič, and Franciscan monk and philologian Stanislav Škrabec. There are many important Roman Catholic sacral buildings in the area, among them the sancturies of Sveta Gora ("Holy Mountain") and the Kostanjevica Monastery, both of which are now located in Slovenia. ↑ di Francesco Fain. "Patto Gorizia-Nova Gorica c-e la firma – Cronaca" (in Italian). Il Piccolo. Retrieved 2012-08-25. ↑ World War I photo of the destroyed cathedral, by Jindřich Bišický, from .